Anthony Ralph Wolryche Stansfeld was born in Winchester, Hampshire, on 4 March 1913. It is unclear how he and Peter Lilley first met, though they were very close in age. Continuing the pen name Dane Chandos, the duo wrote two travelogues: Journey in the Sun (a trip from Mexico to Spain) and The Trade Wind Islands (which takes the reader from Mexico to several Caribbean islands). 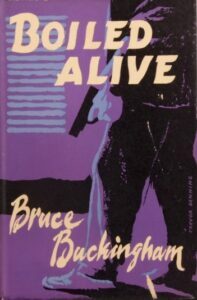 The two men also created the huarache-wearing Mexican detective Don Pancho and wrote two well-constructed stories about his crime-solving exploits: Boiled Alive and Three Bad Nights, for which they used the pen name (or more accurately pen name of a pen name) Bruce Buckingham. Bruce Buckingham. 1956. Three Bad Nights. London: Michael Joseph (Reissued as Penguin edition, 1961). Bruce Buckingham. 1957. Boiled Alive. London: Michael Joseph (Reissued as Penguin edition, 1961).